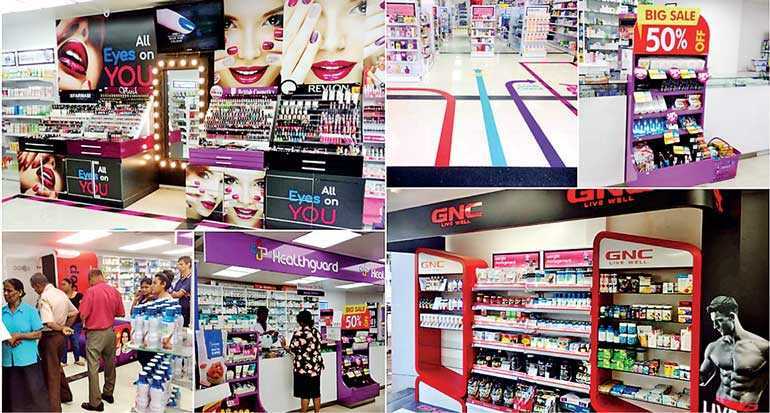 Healthguard, Sri Lanka’s most respected Health and Beauty retail chain, has conceptualised and launched an ‘Experiential Store’ at their Maitland Crescent outlet in Colombo 07, embarking on another first of its kind customer encounter by a Sri Lankan healthcare service provider. The introduction of this state-of-the-art, consumer-friendly store comes as an extension of the strategic business model of the company, which is to address the evolving wellness, beauty and health needs of Sri Lankans through the introduction of world-class products and service. This innovative experience is based on three service areas, which represent beauty, wellness and health. Each area consists of professionals to guide customers on a unique retail experience. The beauty service area is a real head turner for any lady that walks in, with striking digital demonstrations of cosmetic applications and beauty tips, together with a ‘Hollywood Mirror’ feature which adds glamour to the whole experience. This go-to beauty booth consist of five different international brands, including the best-selling Australian brand Ulta3, and provides the service of two professional beauty advisers throughout the operational hours of the outlet (7 a.m. – 10 p.m.). These advisors are ready to answer any beauty related questions and help a customer to find the most suitable product for their requirement. A wellness service area has been rolled out in partnership with GNC, one of the most respected global wellness brands showcasing a premium assortment of wellness products. Customers now have access to the world’s best wellness products with the guidance and expertise of a well-trained and experienced pharmacist of Healthguard. The health service area aims to improve customer convenience in partnership with oDoc. This service enables customers to digitally connect and consult with doctors while at Healthguard, thus eliminating the hassle of waiting to meet doctors. oDoc is a smartphone application that connects patients with doctors for video consultation and care. This is ideally suited for consumers who require basic health consultations and need to obtain a prescription for minor ailments. Consumers can now receive advice directly from a doctor, obtain a prescription and fulfil their prescription all in one go! The service is supplemented by other offerings such as blood sugar and blood pressure check-ups, respiratory capacity check-ups and skin testing. Through this unique service, Healthguard is hoping to maximise their service potential by creating a hassle-free platform for their customers to obtain consultations or required prescriptions from a doctor. “Our innovative Experiential Stores are not just going to elevate our services to the next level but also cater to the utmost wellness and health needs of Sri Lankans and make every visit to our outlet an unforgettable experience,” said Healthguard Pharmacies Head of Operations Infiyaz Ali. Healthguard is a fully-owned subsidiary of Sunshine Healthcare Lanka (SHL) – the healthcare arm of the diversified Sunshine Holdings conglomerate, with a network of 23 outlets across the Western Province of Sri Lanka. The premier retail chain promotes the unique concept of ‘Wellness and Beauty’ amongst Sri Lankans, offering superior products and customer service backed by international standards. Healthguard believes that the ‘Experiential Store’ could be the forerunner to new and exciting initiatives that will change the way Sri Lankans shop in the future.